TOWN Hall bosses have hailed a major housing and business boost for Leigh despite criticism of the deal by an opposition councillor. Wigan Council said their plans for North Leigh Park will attract investment of £310m, securing jobs, houses and business to help grow the local economy. But Coun Gareth Fairhurst, leader of the Standish Independents, accused the authority at last week’s full council meeting of throwing away millions of taxpayers’ money in the way the deal has been struck. Council leader Lord Smith told the Observer the deal was a “fantastic example of private and public sector” partnership. The project is earmarked for a 185 acre brownfield site which the town hall describes as being “scarred by heavy mining remnants” rendering it unsuitable for purpose in its current state. The council has sold its ownership of part of the land to private development group North Leigh Park (NLPGL) for £1 and will invest £10m for a link road through the site, joining the A578 Leigh Road with A579 Atherleigh Way, the town hall said. NLPGL will carry out “remediation” works to the land, bringing it up to standard for housing, business and community facilities. However, Coun Fairhurst told Leigh Town Hall it was a “scandal” the council had sold a valuable asset for £1 and then paid a private group £10m to treat the land, claims the council say are mistaken. He asked: “Why not do it (ourselves) and then sell it? How simple is that. We are talking about being cost effective here. 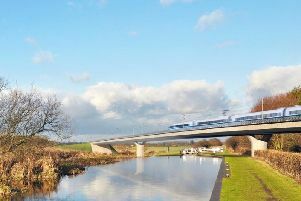 The council said the £10m investment on the link road is expected to be recouped after a decade, while the site, which will be fit for purpose in 2018, will continue to raise funds for the authority through council and business tax. Paul McKevitt, Wigan Council’s deputy chief executive, said: “We feel that the best way to deliver the North Leigh scheme is to work with the developer through transferring the contaminated land which they will remediate. At the meeting, Coun Fairhurst was warned by monitoring officer Linda Fisher not to reveal commercially sensitive aspects of the deal but responded that much of the information was already available on the council’s website. Lord Smith echoed Ms Fisher’s legal warning and added the project has “lots of support” in Leigh. The site is expected to include 1,800 new homes, 51,000 sq metres of business property, 47 acres of green space and community facilities.